The FUCHS Antenna got its name from the Austrian Radio Amateur FUCHS, who first decribed it in 1928. It was a monoband endfeed Half wave dipole. 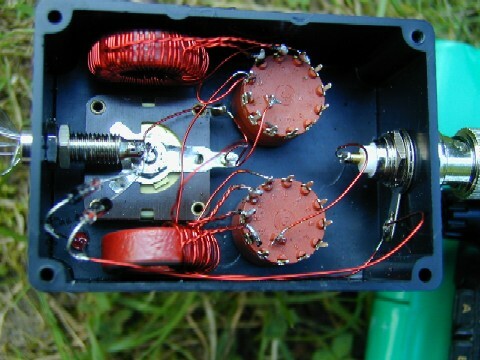 With the FUCHS Network it is possible to use an 41Meter wire on all bands between 10 and 80m. The network fits into a 70mm x 50mm x 25mm plastic enclosure. A BNC plug plus a BNC to BNC connector gives use the flexibility to use it with any rig which has a BNC antenna jack. Tuning is very easy. The first step is, to find the point of maximum noise / loudest signal in receive. 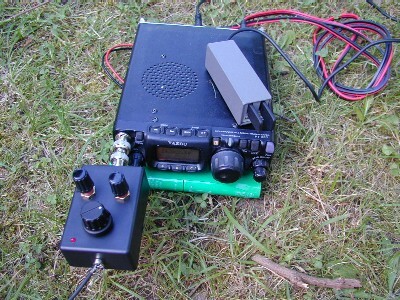 Now with a small transmitter signal, the linkis switched to lowest SWR. Ready. The FUCHS is equipped with an output indikator. Only at the point of resonance, the LED glows. Copyright © 2003,2004,2005, 2006, 2007 QRPproject.